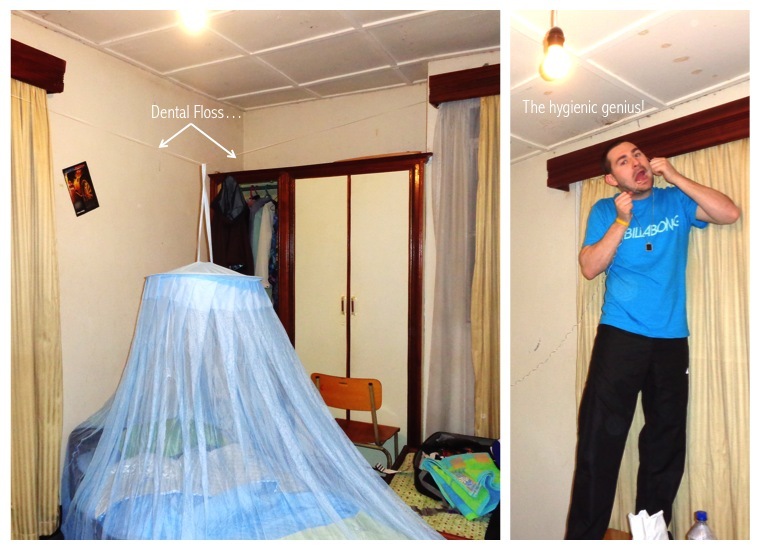 Adventures in Africa: If all else fails, use dental floss. After the locked out-episode on our first night in Kigali, we found internet on the other side of campus and were able to let our families know that we had arrived safe and sound. Before bed, we remembered that we needed to put up our mosquito nets, but unfortunately the one nail we found bent and broke upon our first attempt hammering it into the ceiling. After many creative attempts at getting the nets up, Chris pulled out his dental floss container and we strung the floss across each bedroom, threading it through the windows and moving our beds into odd angles. We had a lot of laughs, and managed to get a good night's sleep, mosquito bite free! Yesterday was another great day. Seeing the campus for the first time in daylight reassured us that the School of Finance and Banking will be a great home away from home for the next month. 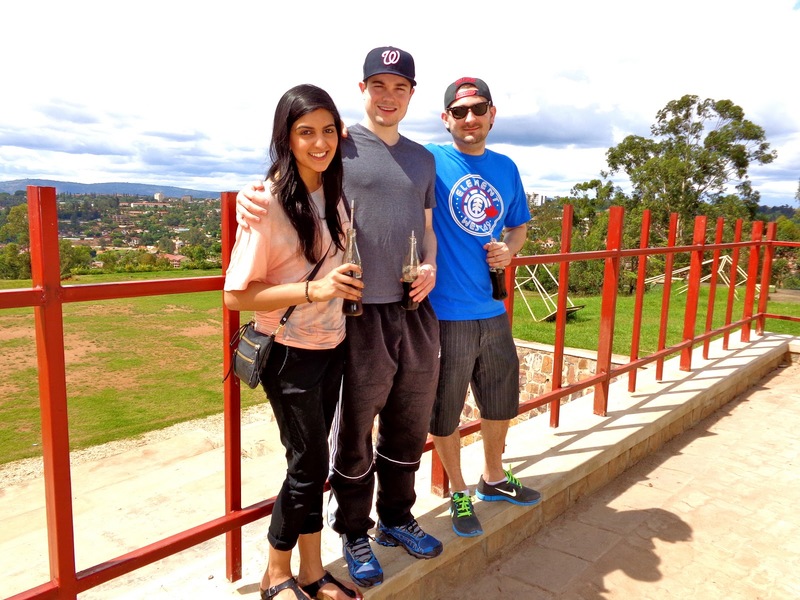 The open concept campus is beautiful, surrounded by lush greenery and safely located uphill from the rest of the city. The first task of the day was to find food… We stumbled upon the campus canteen, and we were thrilled to be charged just 400 Rwandan Francs (around $0.75 USD) for a plate of rice, beans and a sweet potato. It tasted great, and although our stomachs were a bit upset afterwards, it was nice to be in the heart of campus, surrounded by tremendously friendly students. Side-note: everyone is super friendly, but they are often taken aback to see the three of us on campus. We've been getting a lot of stares, and many people call out our races to us as we walk by. This is by far the biggest element of culture shock for the three of us, and makes us feel so privileged to live in ethnically-diverse Canada! After brunch, our liaison, Regis, took us into the city again to purchase our SIM cards. Along the way, and in between stops to pick up snacks and ceiling hooks, he shared with us his pride for how far Rwanda has come in the last two decades. We were deeply touched at how much he wanted to share with us, about the genocide, about life after genocide, and about the country's vision for the future. The most inspiring moment was when we were back on campus, and Regis pointed to another student, telling us that he was his father. He stopped, and told us that the school has an association for genocide affected students, and that the association is structurally set up like families. Each member therefore has an "adopted" set of parents, children, etc. so that students who lost members of their families during the genocide, are able to develop relationships and have someone to turn to. He also noted that everyone is welcome into the club, no matter whether they were affected by the genocide or not, as it promotes inclusivity. All in all, it was a great day, and we were really moved by the stories that we heard. We're really starting to feel connected to this place, and it's only our third day! Looking forward to the adventures to come.